Battleships is a very absorbing logic puzzle that, although not often seen in publication, can be very satisfying and enjoyable to solve. 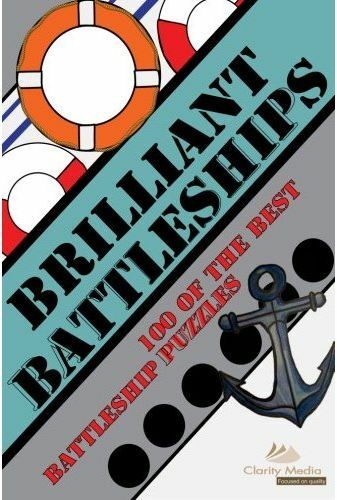 This book contains 100 all new battleship puzzles on a 10x10 grid. There are two puzzles per page, and there are full solutions at the back of the book. You must place a fleet of ten ships into the grid. There is one ship of length four, two of length three, three of length two, and four of length one. These are indicated alongside each grid. Ship segments for different ships cannot touch each other at all, including diagonally. Ships can be placed either horizontally or vertically. Numbers around the edge of the grid tell you how many ship segments appear in that row or column. 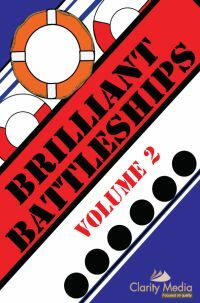 Although the rules are quite simple, solving battleships puzzles can be a real challenge! There are amny subtle rules that you'll discover whilst you go through solving battleships puzzles. Each puzzle in this book has a single solution, and they get gradually harder as you work your way through the book. Be sure to cross off any cells that must contain water (as opposed to a ship segment) whilst solving the puzzle, and cross off any ships as you work out where they are in the grid - this will help you keep track of where you are in the solving process and the deductions that you make whilst solving. We hope you have a fair wind behind your sails whilst tackling our fantastic fleet of battleships puzzles - do let us know how you get on, me hearties! First, mark in the obvious: any rows or columns of 0 can be crossed off and marked as water. Next, look at the ships you are given. Are there any subs? These are ships marked as circles. You know that nothing around them can be a ship, so you can cross off all adjacent cells (including diagonally): this often gives you eight waters straight off. Then look at the larger ship segments: if there is orientation information available, then you can mark in at least one more square of the ship even if you don't know what type it is, and also mark in more water. The next thing to look at once you've done that is to see where each ships of each length can be placed. Typically it is best to start with the longest ship, though not necessarily, and see where it can be placed. There are often very few options for the longest ships. If there are a couple of options, then you might need to visualise the impact of each placement: does it lead to a contradiction whereby placing the ship in one location means that affected rows/columns could now not be completed as required? If there is a contradiction, then that placement can be marked off. Often you will not know exactly which squares are ship segments, but you will know that there are certain limits on where they go, or that one of a group of squares must contain a ship. This can often be used to mark in more water, particularly because of the diagonal constraint. And sometimes you will know, for instance, that there are only two regions in which the ships of length 3 can go but without being sure whereabouts in those two regions they are placed. This means that you now know that they CAN'T be placed anywhere else. If the four is already placed, this means that any other ships of length 2 you have that you thought might extend into a three ship can't extend, because then you would be placing too many three ships, and therefore they can be 'sealed off' with water and crossed off the list. 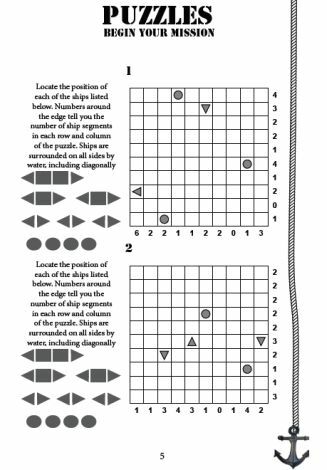 As it can be seen, there are lots of rules both obvious and more subtle that can aid with solving harder battleship puzzles, and whilst with the easy and some of the medium you won't need them, as you get to some of the harder hard puzzles, then you will need to use a wider range of solving rules to reach the unique solution that exists for each puzzle.